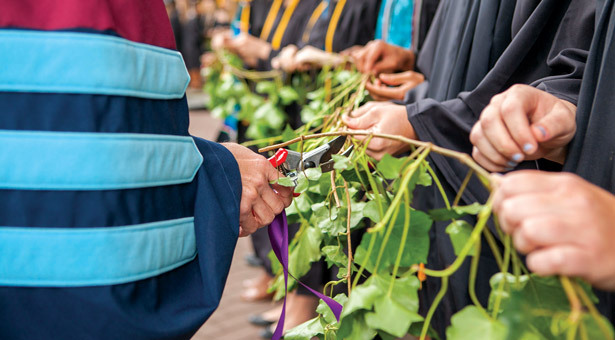 At Graduate Commencement, Undergraduate Commencement, and Ivy Cutting (above) ceremonies, SPU graduates are commissioned for service in the world. Freedom. When I think of the word “freedom,” I think of a scale in balance. One side of the scale measures all that is gained through freedom, while the other side weighs the cost or effort to achieve all that is gained. For a university, the underlying value and outcome of an education is freedom. As the scientist and inventor George Washington Carver put it, “Education is the key to unlock the golden door of freedom.” The freedom of an educated mind does not come without a cost. It requires an investment of time and money, even self-sacrifice, to open that golden door. Our culture tends to privatize educational value; that is, we think of the value of education in terms of an individual’s benefit. We imagine the sole benefit of an education is to advance the social and economic status of the individual. I believe quite the opposite is true at Seattle Pacific University. I think true freedom is found in a life focused on others. This is where the other side of the scale finds balance, where a life of significance and equilibrium can be obtained. This is a life lived beyond merely outward success. At Seattle Pacific, this vision of freedom is tied to our overall University vision, which is, at its core, Wesleyan. John Wesley believed that God’s grace is sufficient not only to forgive and save, but to redeem, restore, reconcile, and recreate. Wesley believed in the faithful performance of works of mercy — in extending grace to those we encounter along life’s journey. Because of our belief as Wesleyans, we also assert that God is in the process of reconciling the world, or making the world right. Reconciliation is the foundation of the gospel. Christians believe we are reconciled to Christ through the forgiveness of sins made possible by the death and resurrection of Jesus Christ. It is by grace and mercy that we are restored into a right relationship with God in Christ. We encounter freedom in Christ. Then, as we allow the Holy Spirit to radically transform our lives, we are challenged by, and entrusted with, the message of reconciliation. We can be motivated, empowered, and find joy in working to free others from that which binds them. There are areas in our world where change and extended effort are needed, but progress can be filled with struggle. These areas include inequality, illiteracy, human trafficking, hunger, sexism, racism, addictions, health concerns, and homelessness. The human activity of loving and setting things right flows out of God’s faithful and redeeming character. When we seek justice, we are expressing God’s commitment to relational righteousness. I think both of these ideas — the expression of love and the pursuit of justice — are part of God’s reconciling plan for his world. And, as a University, we seek to graduate people who live a life of service, people who can interpret the cultures of our day and recognize the gaps, inequities, and the needs in our world — and then imagine how life could or should be, and work toward that end. This issue of Response magazine explores meaningful work to combat one very troubling reality: human trafficking and modern slavery. And there are additional focus areas Seattle Pacific is pursuing, as part of our long-standing commitment to model reconciliation and contribute to community health and wholeness. One significant area is SPU’s commitment to address the issue of homelessness, fully developed in our strategic plan. This is an effort to model for our students how to engage the culture and change our world through an interdisciplinary, curricular, and co-curricular approach. We aim to become a primary partner with individuals and with civic and community organizations toward ending homelessness in the city of Seattle and King County. Hosting Tent City 3 for a second time on our campus this winter was a meaningful step in this plan. As I personally learned through the life stories I heard from residents of Tent City 3, the path into homelessness is wide and varied, a path reflected in the range of individuals’ stories. But, I also learned about the potential path out of homelessness. This is where the collective story — the story shaped by multiple individuals coming together — can help. Wide and varied strategies, as well as the collective and creative power of community, can bring solutions to life. What do I mean by community helping solve homelessness? In a city that has produced technology that has changed our world, I believe we collectively possess the creative capacity, the institutional and individual will, and the courageous conviction to do the extraordinary and create a pathway of hope for our neighbors who are homeless and without shelter. We can bring hope for their future — and our own — by reflecting the type of free, reconciling community we want to be known as, and known for.